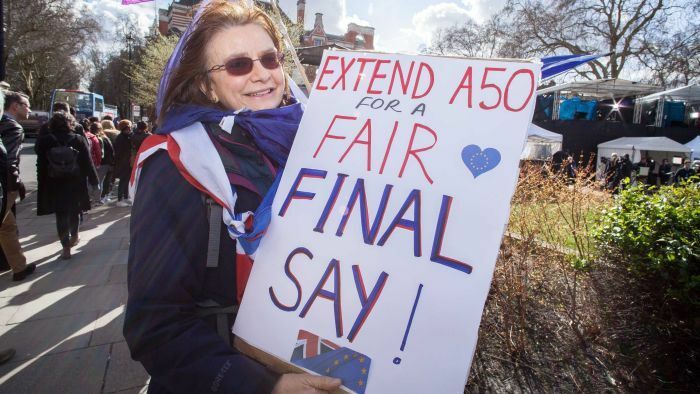 Just 15 days out from when the United Kingdom was supposed to withdraw from the European Union, the British Parliament has voted to ask the EU for a delay of the Brexit deadline. MPs in the House of Commons carried the motion 412 votes to 202. Prime Minister Theresa May will now travel to Brussels to try and seek an extension until June 30, but it is understood EU officials will push for a longer period of time. Earlier, Mrs May narrowly survived a bid by the Parliament to wrestle control of the Brexit process from her Government. Voting on a cross-party amendment to give Parliament a say on withdrawal negotiations, MPs wound up 312 for to 314 against, a losing margin of just two votes. The amendment stated that its intent was to “enable the House of Commons to find a way forward that can command majority support by effectively giving MPs the power to take control of parliamentary time from the Government”. An earlier vote on an amendment to hold a second referendum was defeated 85 votes for to 330 against, with Labour MPs abstaining from voting.